Well, here we are, folks. We’re now at a point in Seinfeld that some people actively do not like. I’m not one of them, but there’s no doubt that the show’s final two years suffer in comparison to its greatest ones, although we never got to a Simpsons-style situation where the show was just piling tons of lackluster material onto its greatest years. Still, when talking to Todd VanDerWerff about season eight, I noted that these episodes seem to show up in reruns much more frequently than the others. I feel like I’ve seen “The Merv Griffin Show” a hundred times and yet some of the episodes that I’ve covered in the past felt totally new. I may be imagining this or exaggerating it in my head. It’s not like Seinfeld sold out the minute Larry David left the building, or lost all of its “edge,” or anything like that. But there is a goofier humor at work here, and a slightly looser plotting sensibility. Witness George’s “KHAAAAN!” moment or Kramer’s child karate subplot or Elaine’s big sombrero. It’s not like this stuff it coming out of nowhere, but there does seem to be a bit more of it out there. Is that a bad thing? Not necessarily. Jerry Seinfeld’s comic sensibilities are great and a lot of these jokes are really funny. It’s just a little different, and that can be a little upsetting, especially for such a good show. I’m yammering on about change, but “The Foundation” actually picks up where season seven left off, although there’s been three months of mourning for Susan over the summer. But we open with a shot of her grave, and then watch George start to enjoy bachelor life once again, walking around his apartment in athletic shorts and eating giant chunks of cheese the size of car batteries. “Before we go any further, I would like to point out how disturbing it is that you equate eating a block of cheese with some sort of bachelor paradise,” Jerry notes, to deaf ears. But try as he might, George keeps getting sucked back in to the Susan universe, all because Jerry quotes Wrath Of Khan at Susan’s parents in an awkward moment. We’ll get to the foundation in the next episode where it’s more important, but the interesting thing about George’s plot here is that it actually backpedals a little from the season seven finale. George insists that he’s done three solid months of mourning and wants to ease back into single life, but we all remember his lovely phone call to Marisa Tomei in “The Envelopes.” Of course, the abrupt lack of reaction from George to Susan dying is part of the joke there, and his three months of mourning may have been perfunctory at best. Aside from the death-of-Susan aftermath, “The Foundation” is very silly stuff. Jerry’s ex-girlfriend of the week Dolores (a.k.a. Mulva) from “The Junior Mint” shows new interest in Jerry because he was engaged—“I’ve got the stink of responsibility on me!” Jerry cries—but she disappears just as quickly before anything really happens. 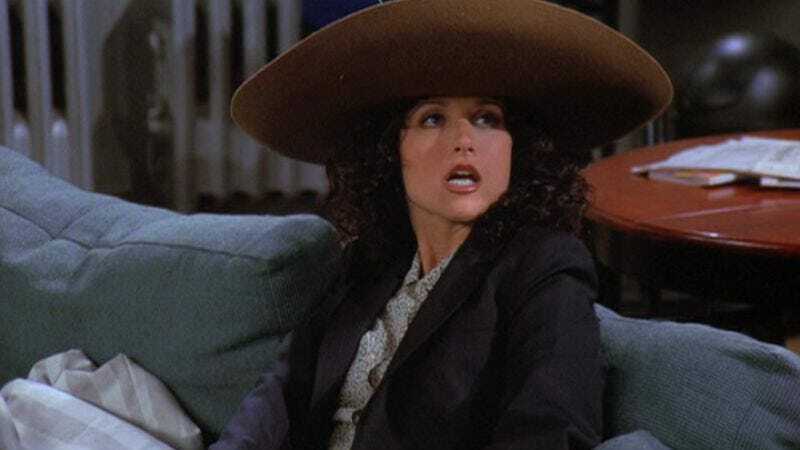 Elaine takes over the J. Peterman catalogue and puts a ridiculous sombrero on the cover. The less said about Kramer’s karate skills, the better. There’s definitely some laughs in these plots, but the whole episode feels like the show is re-orienting itself a little bit, a feeling that continues into the next episode, which follows up on the foundation plot. Really, this episode should be called “The Foundation” because most of the action centers around George’s time with Bruce Davison and his other board members selling off all of Susan’s riches that could have been his. There’s two jokes at work in this episode that don’t entirely gel—George is wistful for the life he might have had with Susan, but he’s also struggling to get out of the foundation so he can work his “widower” magic on the ladies—Jerry focus-tests the story with the staff at Monk’s and it goes over very well. What I like about “The Soul Mate” is that the half-hearted love triangle between Jerry and Kramer and Jerry’s girlfriend Pam is a cute commentary on Jerry’s fickle nature with women. Kramer is head-over-heels for Pam, but doesn’t want to intrude on Jerry’s territory, although his romance adviser Newman obviously cares less about that particular wrinkle. There’s a lot of Cyrano De Bergerac overtones to this episode, such as the scene where Newman recites lines for Kramer to say to Pam, but for me the funny stuff is when Kramer just approaches Jerry directly. Jerry is not “gaga” for Pam, as Elaine already noticed, but once Kramer rhapsodizes about her to him, he comes around. “She’s real! She can bring home the bacon and fry it in the pan!” Kramer says. “The voice, the calves, the bacon, I think I can! I even like the name!” Jerry eventually decides. This feels completely natural for Jerry, whose opinions on the women he’s with seem to shift mid-conversation and sour with the slightest mispronunciation or quirk. The wheels come off the plot pretty quickly as it’s tied to Elaine’s story where she dates a guy (a young Tim DeKay) who professes a lack of interest in having children. Pam has the same lack of interest, so suddenly everyone’s trying to get a vasectomy, but there’s not enough time to really squeeze it all in before the end of the episode, so the dovetailing of the plots feels clunkier than usual. Newman’s love for Elaine also bothers me—it’s not a permanent thing for the show but it lasts long enough and it just feels too easy. 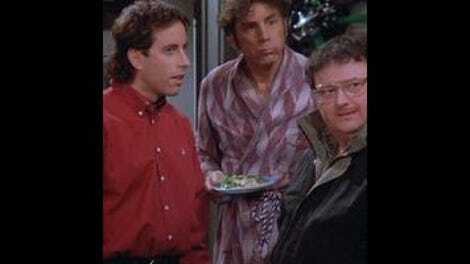 Newman should be too consumed with hate for Jerry to really like any of his friends that much (aside from Kramer). Sure, Elaine is an alluring lady, but Newman’s supposed to be aloof and dismissive of anything to do with Jerry, as shown in his interaction with George last season. The plot also comes across as half-baked, tying into the vasectomies without any kind of satisfying punchline or conclusion. So, it’s a rocky start to season eight, but next week we have “The Bizarro Jerry,” which I remember liking. Once Jerry Seinfeld was in full control of the show, it took him three episodes to do a Superman-inspired joke—can’t say I’m surprised. We’re now officially done with the standup interstitials, since Seinfeld was devoting all of his time to the show. Do you miss them? They often get chopped from the syndicated reruns anyway. Each episode is dedicated to staff members who died—the very funny writer Marjorie Gross and prop master Victor Wayne Harris. The ugly baby from “The Hamptons” and its mother reappear here.